Braintree, MA (December 8, 2017) – Sisters Karen Fish-Will and Melissa Fish-Crane, CEO and COO respectively of full-service real estate and property management firm Peabody Properties, have been named the 2017 Professional Women of the Year by the Boston IREM® Chapter #4. 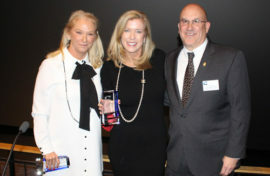 The award was announced during the organization’s holiday party, held December 6th at the New England Aquarium. Fish-Will and Fish-Crane, both principals of the company founded by their late father Edward A. Fish, were lauded for guiding Peabody Properties into a new phase of smart development, adding close to 1,200 units under company management since the first of 2017 and for fostering a company culture of fun, diversity and growth. Enhancing the quality of life for all its residents is important to Peabody Properties and, with their specialty sector, Peabody Residents Services, Inc., Fish-Will and Fish-Crane are able to provide more than bricks and mortar – they provide supportive services and programs that respond to the needs of their residents. Moreover, a mission to put an end to veteran homelessness has prompted Fish-Will and Fish-Crane to form Peabody Veteran Supportive Housing; to date four Veterans Housing Communities have been developed for formerly homeless veterans with additional communities planned. These are fundamental building blocks that support how Peabody Properties puts the HOME in housing. Fish-Will’s career in the multi-disciplines of real estate spans more than 35 years. Her many credentials include: a designated REALTOR® member of the Greater Boston Association of REALTORS®; member of the Board of Directors and Executive Committee of the Greater Boston Real Estate Board; member of the Greater Boston Real Estate Board Government Affairs Committee; and member of the MassHousing Community Services Advisory Committee and Board for New Lease for Homeless Families. Fish-Crane has dedicated over 20 years in the management of client-owned multi-family residential and mixed-use real estate developments. Her impressive credentials include: designation by the National Affordable Housing Management Association as a National Affordable Housing Professional; Chair of the Board of Directors of the National Affordable Housing Management Association’s Educational Foundation; and member of the MassHousing Multi-Family Advisory Committee. Earlier this year both Fish-Will and Fish-Crane were named to the prestigious “Woman of FIRE” list; the annual recognition award acknowledges key female players in the local FIRE (Finance, Insurance and Real Estate) sectors, and celebrates the best and brightest women in their industries.